Warm Barley Salad | "Il faut goûter"
First of all, barley is yummy. Barley is comfort food. It cooks up into soft pillowy kernels, begging to be added to a savory vegetable soup or used like pasta in a healthy salad. I recently attended a lovely afternoon dinner party at the home of a local professor (whom I really barely know), invited by some of my Arabic friends, one of whom was “adopted” by her as a foreign student looking for a host family with which to gain cultural exposure. Boy, was he lucky. From the two times I have visited this lady, I have learned three things about her: 1–Her house is gorgeous, 2–She’s highly intelligent, fun, and spunky, and (to my delight!) 3–She’s a creative foodie with a well-stocked kitchen full of unique (many antique) utensils! I was in wooden-spoon heaven! To this little dinner party, I contributed a Warm Barley Salad, very savory and fragrant, dreamed up in my head a mere couple of hours before the potluck. It’s lemony-herbal flavors are reminiscent of the Mediterranean, with a nice rich burst from the sun-dried tomatoes. I wasn’t necessarily planning to blog about it, but it was met with wild approval and leftovers were happily taken home by other party attendees. I also made this dish for a work Christmas party, since its tomatoes and green peas are festively colorful, and it was again a success. So I’ve been asked for the recipe several times by various partakers–friends and librarians, this is for you! Sitting at that table with this history professor and several of her adoring past and current students, the lot of them making jokes about students in the “survey classes” who can’t keep their historical facts straight, I wondered briefly, “What am I doing here?” I too am quite un-gifted at remembering dates and facts and piecing together the historical ‘big picture.’ I can’t hold my own in a witty history discussion. It’s just not my thing. I was there because I love food, and I especially enjoy watching someone from anywhere else in the world prepare a dish exotic to me. I love food, and the two people who invited me chez their professor-friend know this. The afternoon held a special treat: Thana and Abdulrahman made Konafa, a sumptuous Arabic dessert, and I watched and took several notes and photos. Soon I’ll make this surprising dish myself! 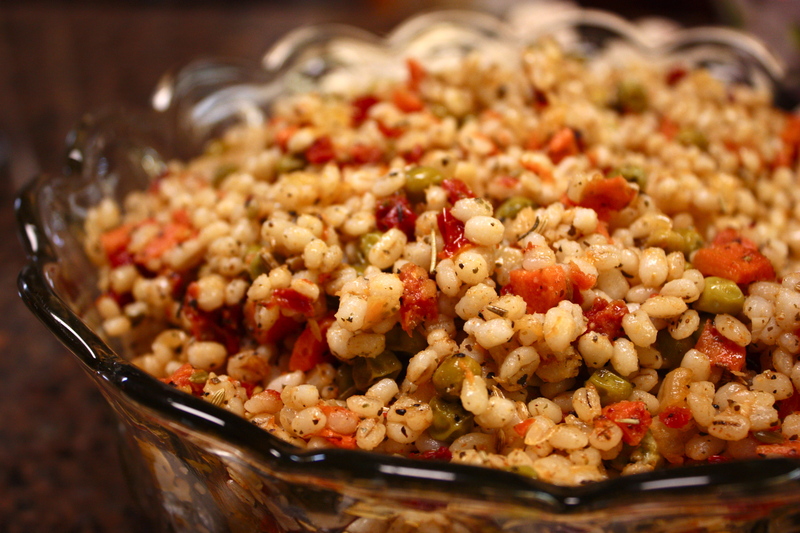 For now, here’s that Barley Salad Recipe, for all of you who enjoyed it! 2. Sauté carrots in about 4 tbsp olive oil until almost tender (about 20-25 minutes—cover with lid for about half of cook time). Add onions and sauté until softened, then add garlic and sauté 2-3 minutes more. Add lemon zest and juice and tomato paste, and stir into vegetables. Pour in the frozen green peas and cook 5-8 minutes over medium heat. Add sun-dried tomatoes, fennel seeds, and herbes de Provence. When the barley is fully cooked (chewy, not crunchy), add it to the pot with the vegetables. Stir everything together and add salt, pepper, and cayenne to taste. (In fact, add more of any of the ingredients to taste!) Add enough olive oil to dress everything nicely. 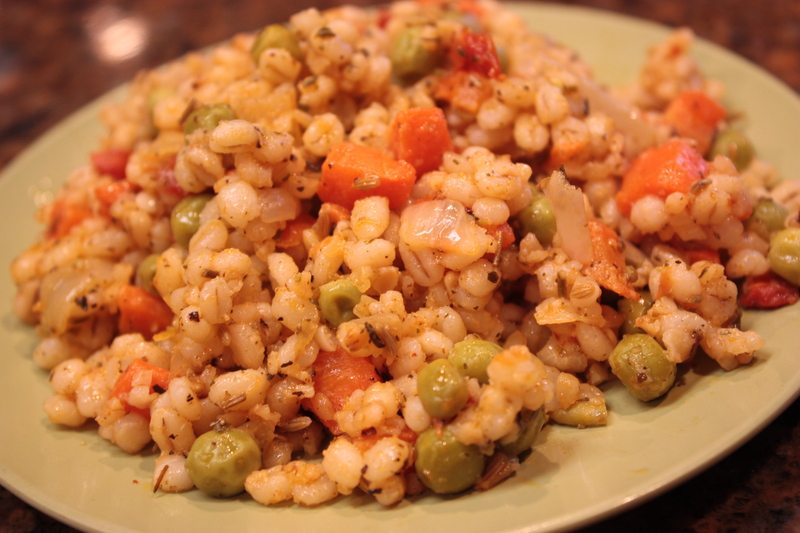 *The first time I made this, I used both barley and bulgur. Bulgur cooks in only about 10 minutes, so after the barley had cooked for 35 minutes, I added a bit more water and the bulgur to the pot and cooked it for the last 10 minutes so both grains were done simultaneously. This entry was posted in Savory and tagged barley, Cooking, food, potluck, recipe by needtotaste. Bookmark the permalink. 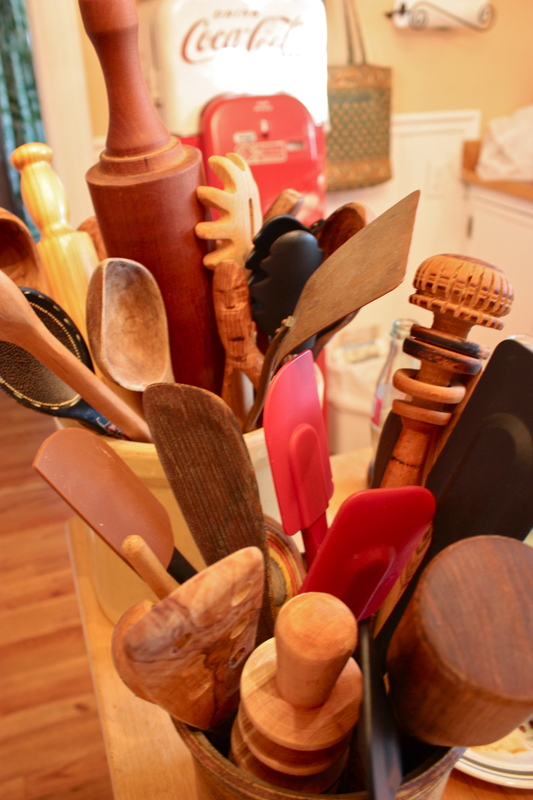 I’m seriously jealous of that wooden spoon collection. This looks amazing too. I love barley. This looks great — I love the fresh flavours — and what a beautiful headline photo! I also covet the wooden spoon collection. This’d also be delicious made with rice, with couscous, with bulgur. But barley is so tasty; I love the chewy, earthy nuttiness it can bring to dishes. This ought to be great. Looking forward to the dessert too. And that’s a beautiful shot of the utensils! This looks so good. I’ve never tried cooking barley, but I think I can do this! It sounds absolutely delicious. Thanks for posting! So easy! And, you’re welcome!